How mindful practices give you the space to respond differently under pressure—plus, a meditation for lowering stress levels. You’ve probably heard that mindfulness helps reduce stress. But how does being mindful actually help you do that? 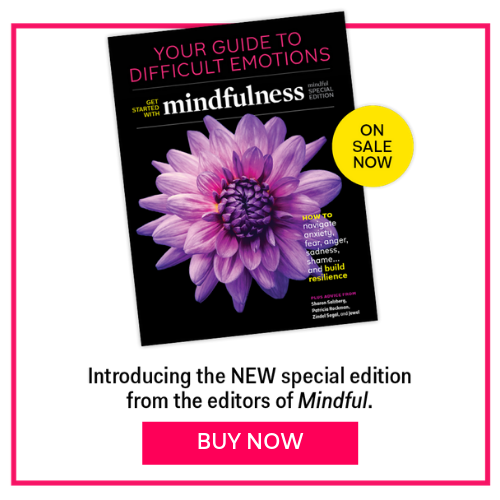 Mounting scientific evidence from hundreds of universities—including dedicated centers at the University of Massachusetts Medical School in the United States and the University of Oxford in the United Kingdom—strongly suggests that mindfulness not only reduces stress but also gently builds an inner strength so that future stressors have less impact on our happiness and physical well-being. 1. Bring to mind a current challenge in your life that is the cause of some stress. A situation that you’re willing to work with at the moment. Not your biggest challenge but not so small that it causes no stress at all. A 3 on a scale of 1–10 is a good guide. 2. Bring the situation vividly to mind. Imagine being in the situation and all the difficulties associated with it. 3. Notice whether you can feel the stress in your body. Physical tension, faster heart rate, a little bit of sweating, butterflies in your stomach, tightness in the back or shoulders or jaw, perhaps. Look out for your stress signals. 4. Tune in to your emotions. Notice how you feel. Label that emotion if you can, and be aware of where you feel the emotion, exactly, in your body. Just try to spot it as best you can. The more precisely you can locate the emotion and the more you notice about the sensation, the better. With time and experience, you’ll keep getting better at this. 5. Bring mindful attitudes to the emotion. These include curiosity, friendliness, and acceptance. 6. Try placing your hand on the location of the sensation—a friendly hand representing kindness. Do it the way you would place your hand on the injured knee of a child, with care and affection. 7. Feel the sensation together with your breathing. This can promote a present-moment awareness and mindful attitudes to your experience. 8. When you’re ready, bring this meditation to a close.